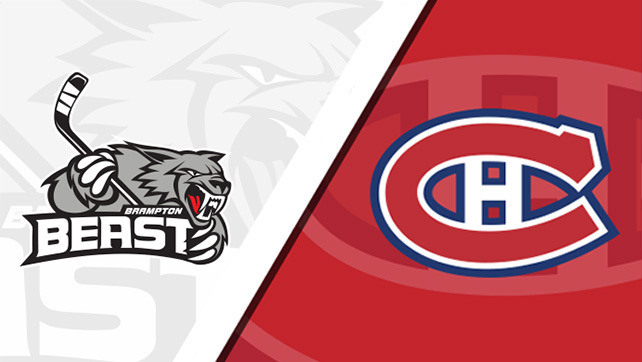 BRAMPTON – The NHL affiliate of the Brampton Beast, the Montreal Canadiens, were instrumental to the success of the Brampton Beast in countless ways throughout the 2015-16 ECHL season. Today, the Beast are excited to announce that the relationship between Montreal and Brampton will continue to grow, as the teams have agreed to renew the Beast’s affiliation with the Canadiens through the end of the 2016-17 ECHL season. Beast President and General Manager Cary Kaplan is excited to once again partner with the Canadiens organization and believes that Montreal will play a large role in helping lead the Beast to their first Kelly Cup championship. “It’s a great pleasure for the Brampton Beast organization to be able to extend our partnership with the most storied franchise in NHL history,” Kaplan said. The same sentiments were echoed by Canadiens General Manager Marc Bergevin, who is excited to see more Canadiens prospects flourish throughout the 2016-17 season in Brampton. “We are excited to continue our relationship with the Beast organization,” Bergevin said. The 2015-16 Beast roster featured ten players that were assigned to the club by the Canadiens and their American Hockey League affiliate, the St. John’s IceCaps, including rookie defenseman Travis Brown and the IceCaps’ 2015-16 Fan’s Choice award winner, goaltender Eddie Pasquale. Kaplan, along with Beast Head Coach Colin Chaulk and Assistant Coach Peter Goulet, are excited to not only help develop Canadiens prospects into NHL-ready talent, but believe that the development of such prospects can be beneficial to both clubs, both in the short and long term. “From a Beast perspective, we appreciate Montreal’s commitment to not only the development of players, but their belief that a Brampton run for the Kelly Cup is in the best interest of their prospects. For all those reasons, we believe there is no better partner for us than the Montreal Canadiens,” Kaplan said.